So, I have had this as a gigantic 89 MB .tiff file for about a year. WAY to large to do much of anything with. But I finally found a converter that I could live with (meaning it was free)..... So now it is a mere 3.8 MB .pdf file. Since Forever Yours was available from 1990-1993 and Shadow Iris was in production from 1985-1995 and Country Cornflower was produced from 1988 to 1993, the pattern overlap occurs between 1990-1993.. Thus I am assuming, since no other patterns seem to exist, that this is the time frame of the Crock Pot's production. I continue to hope that I will run across a White or Beige one, but to date, I still haven't. 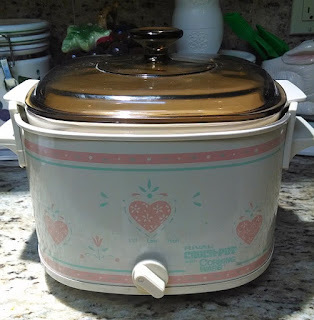 Where is your Corning Ware (Crock Pot)?? Love love this cocktail pot. I've had the cornflower pattern since the early 90"s. I have had several other brands but this is my favorite. Why did Rival stop making the crock-pot with CorningWare? I know, right...? Best invention ever! Production stopped when Corning Ware sold the company. You can tell which products are before or after being sold because the old trade mark had Corning Ware as 2 words; and the new company has it as one word (as in CorningWare). All the best stuff is from before the company sold. Such a great kitchen workhorse. So sad they quite making them. Had mine for years and still use it. Have 2 white 3 qt dishes so I can switch out. Oven to table and no washing in between. Didn't know about other pattern. Have the Shadow Iris. I have the country cornflower crock pot and I still use it. I have the original insert with lid and I bought a plain white one as a back up in case I broke the first. Comes in handy when I want to do two things. I just got one Friday at a church sale for $3. I ♡♡♡♡♡ it! Hi Shane. 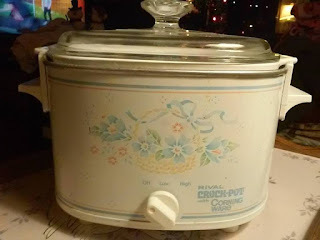 I don't know if you are still doing this blog & by the way I love it as a corning ware collector, but seems there is a 4th Rival Crock Pot with the corning ware like this in the English Meadow pattern. While browsing Replacement.com I saw it when I entered Rival Crock Pot with Corning Ware insert. I have one of each of the three you've shown & lover them. I sure wish I could get my hands on the 4th, but will settle with the ones I have until maybe I run across it (fingers crossed). Just wanted to pass this along & I love all of you knowledge on Corning Ware! 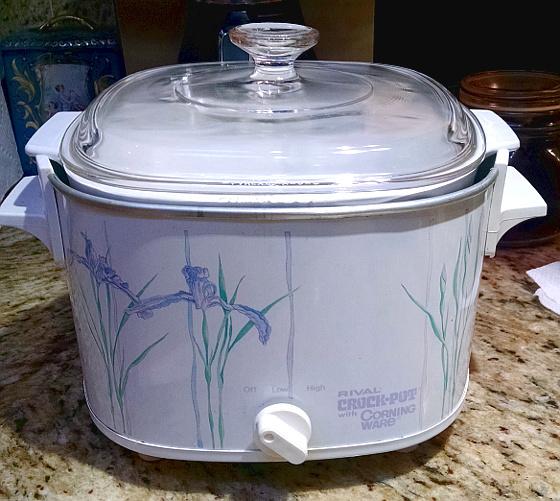 I got the Shadow Iris crock pot as a wedding gift and am still using it nearly 30 years later -- found an extra corning insert at a charity shop, so I can switch out. Our favourite family recipe, which can *only* be made in the crock pot, -- is "Gourmet oatmeal" which you make with steel-cut oats (only! ), apple-juice instead of water, and add raisins, Craisens, chopped dried apricots, and dried blueberries. Slow cook overnight. Don't forget a little salt, but add it at the table. Even people who hate porridge ask for seconds. We do this for traditional Xmas or birthday breakfasts. That's much like how I make my oatmeal -- though Sounds a lot like my oatmeal -- steel cut oats are the way to go! I use peeled and diced apples rather than the apple juice (and water otherwise) plus raisins and cinnamon, but usually also add a little honey. I bake mine in the oven at 225 degrees Fahrenheit for about 4 hours (in Corning Ware, of course). YUM...!